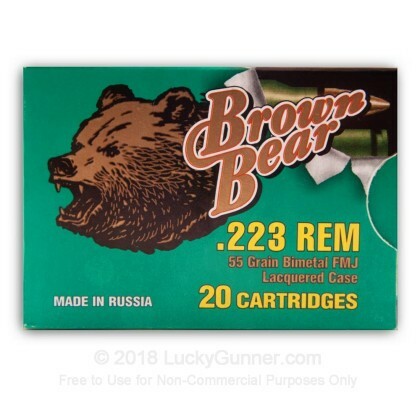 Newly manufactured Brown Bear ammunition in 500 round cases (20 rounds per box, 25 boxes per case). Manufactured in Russia, this product is great for target practice or range exercises. It is steel-cased, berdan-primed, non-corrosive, and non-reloadable. A great all around economical way to hone your shooting skills. Ran about 250 through my bushmaster...no jams or misfires. Would definitely buy again. To those negative reviewers - keep your rifle clean. 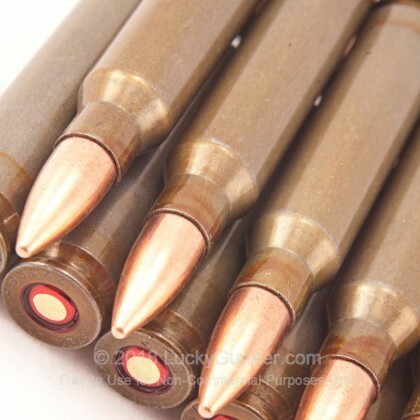 I put 2000 rounds of this through my M16 in an afternoon, most of it on full-auto or burst. I ran about half of it through a piston upper and the other half through a conventional gas w/NiB BCG. I started everything off with a very, very, very light bit of oil on everything (that's how I store it). I didn't add any lubricant at all. The piston system devoured it mercilessly and was indistinguishable from before to after. The conventional gas system was almost as nice. Started to get sluggish around 800 rounds so I pulled the BCG and wiped the carrier off with a cloth (yay NiB!) and went right back to flawless. It's dirtier than other .223, but no-where near as dirty as the best 5.56 I've ever seen. (if you don't know the difference, now would be a good time to go look it up). If you know your weapon and have it tuned for .223 or even split for .223+5.56 this stuff is great. If you are tightly tuned for 5.56, no .223 will cycle it reliably and this is not a magical exception to that rule. Used about 100 rounds. Seems to shoot fine until you get the barrel hot. Starts jamming and leaving residue from primer sealant and shell covering. Bought this thinking that it was a great price for 500 rounds of .223. I shot about 50 rounds of this and the shells where getting stuck in the barrel due to the anti corrosion process they do. 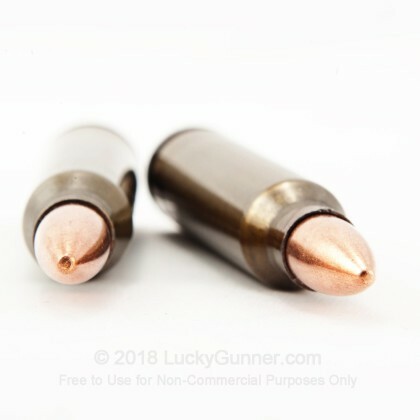 The rounds do well if you shoot single slow shots but if you do rapid fire then the lacquer that coats the shells heat up and get stuck in the barrel. Buy different cheap ammo. Just got my first black rifle, I got this ammo to break it in. Great value! 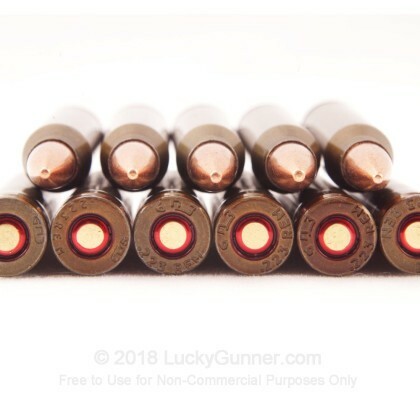 (1000 rounds) Lucky Gunner had it in stock and at a good price when it was out of stock most anywhere else! Fast shipping and good performance, zero'd my red dot scope with very consistant groups. I fired 60 rounds of Federal 5.56 Nato rounds then fired 60 rounds of Brown Bear .223 at 50 yards. I didn't see any difference. Went to 100 yards and didn't notice any difference. Fired another 120 rounds of the Brown Bear for fun. I had no jams, misfires or any other issues with the ammo. I have bought bulk ammo from other reputable sources and have seen dammaged brass and had missfeeds. Some people mention "cleaner powder". I have fired a few better brands and have had to scrape hardened carbon off my bolt. I still had to scrape after the Brown Bear but it seemed to me that it was easier and less caking. I would recommend this to anyone. I was sceptical at first, thinking you get what you pay for, but I was worried for nothing. My SIG556 10" eats it up a spits the used-up steel 12-15 yards. Never a "failure to fire", never a "failure to feed". Clean up has never been a problem. The only issue to me is availability. I CAN'T GET ENOUGH! 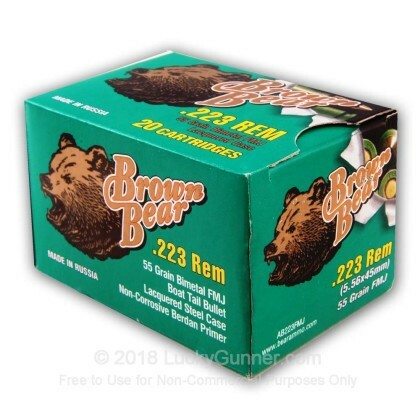 I read quite a few reviews on the Brown Bear before buying this 500ct box. I was not disappointed at all by the Brown Bear. It loaded, fired, and ejected without failure in my DTI 50rds in a row. I used both a Magpul 20rd PMag and two of the plain, metal M16 magazines. I'll buy more if i can catch them at a bargain like I got from Lucky Gunner again. 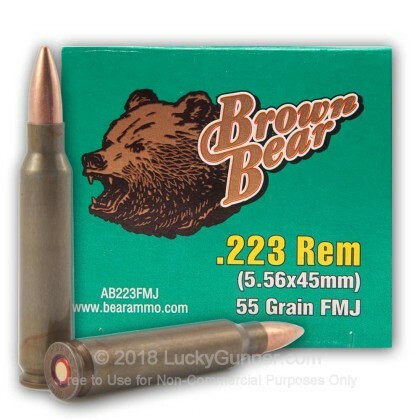 For most who are buying brown bear or silver bear ammo, you are shooters in the know, who will be putting 500-2000 rounds out in one or two range sessions. 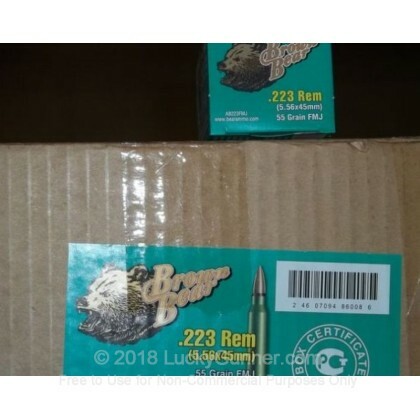 This ammo is great, cheap, and works. If you have a quality rifle you will not experience the kind of malfunctions common with Wolf or Tula. Just lube your weapon up real well and enjoy. 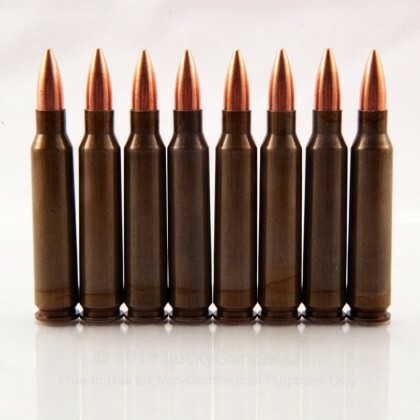 This is not precision ammo, if you are shooting long range or hunting, get match ammo. This ammo will go bang, will hit where you aim, and will keep you sharp. Happy shooting! Should have just bought a box of 20 to try out, but I bought 500 cuz I couldnt wait to get a decent amount to shoot from my bushmaster, Every Round Miss Fired. They would fire the 2nd time I loaded them (its like the primer was seated to deap in the shell) .. Cant beat the price, but dont buy in bulk until you know it fires out of your gun. I wish remington was the same price. Q: Are the polymer coated steel casings magnetic? A: Hello Breon, This Brown Bear ammunition is loaded with a lead core, bi-metal jacket projectile. Due to the bi-metal jacket, this ammunition does contain steel and will not pass any type of magnet test.